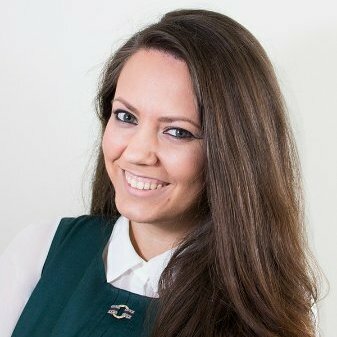 Karina is a member of the global initiative “women in tech”, an experienced IoT & Blockchain developer and an international speaker, who has been awarded the Trust of The Audience Award in 2016. She has Master degrees in Applied Informatics in Economics and Geospatial technologies, besides of this she has worked as Developer Lead and as Sales Engineer last 12 years. – IT companies using agile environment across the world, companies using agile environment, such as CredoAMGroup Development Company (Singapore, Amsterdam) and whatever mobile GmbH (Germany). Her social responsibility and communicative competence are demonstrated in the organization of professional networks, events, and conferences. Organization and management skills fostered through Positions of the Head of planning and accounting of public investment branch of the Ministry of Economics (2013, 8 subordinates); Head Engineer-Programmer at the Administration of Special Communication and Information of the Federal Protection Services (2011-2013, 12 internal and 50 external subordinates); Head of IT Department of the development Company “CredoAMGroup” (2009-2011, 5 subordinates). At the same time she gained public speaking skills gained through frequent academic presentations, workshops (about 35 workshops in 2016, e.g., GEO-C Workshop, Workshops in the Delegation of the European Union 2013-2016, DevIt 2016, WTC 2016 San Jose etc.) and participation as a speaker at IoT and DevOps conferences (about 26 conferences in 2016 e.g., Geomundus, Modern problems of modeling in economics and innovation technologies, IoTSlam 2016, DevTalks 2016, Codemotion Milan, Codemotion Warsaw, WTC 2016 San Jose, Voxxed Days Belgrade, Devoxx Morocco, TOP-5 DevRel Speakers 2016 etc.). – Participate in trade fairs & conferences worldwide, by giving talks and represent HSC. – Manage content creation about the projects for both online and print media. – Direct all social media activities, create effective campaigns to engage w/ tech communities. – Manage website, page design, copywriting, UX & and ongoing evaluation of traffic analysis. – Support the teams to obtain an in-depth understanding of the product and its requirements. – Produce high-quality documentation that meets applicable standards. – Write easy-to-understand developer guides and tutorials for the end-users. – Test and debug the software developed by HSC. – Define the project requirements in the field of Blockchain, IoT, and cryptocurrencies. – Build a positive working environment for the team, inspire & motivate team members. – Supervise, guide, manage team members in line with company policy and procedures. – Proactively report and manage upwards to management and the business, so that they are well informed of the work currently in development. Global Women in Tech (GWiT) is a non-profit organization, founded in 2017, that promotes diversity and facilitates sustainable economic growth through international partnerships with organizations, companies, and universities meant to bring in innovative programs aimed at enhancing the educational and professional development of women. Advisory Board brings together renowned leaders from the international and national business environment, with expertise in technology, entrepreneurship, and leadership. They stand out as role models through their extensive experience and professional achievements and play a decisive role in setting GWT’s growth direction. – An agile development environment. – Develop and maintain complex infrastructure software solutions. – Define, evaluate and implement of user stories and new standards. – Configuration management and continuous integration/deployment. – Integration and development with Java, C++, Python, SQL, Spring, EJB, Docker, Puppet, EMC. – Due to test automation configuration, execution, reporting, monitoring, and troubleshooting. – Worked on the administration of storage systems (EMC). – Karina Popova has been an Initiative coordinator. – Preparing, giving and promoting a talk during international conferences. – Networking with developers, Providing workshops and knowledge sharing. – Maintaining, updating the register of capital construction. – Preparation of conclusions about the effectiveness of investment projects. – The program for the establishment/upgrading of work positions. – Preparation of materials for operational session and meetings. – Preparation of the Interdepartmental Commission on pricing in the construction (197-PP). – Consideration of draft laws and regulations (including the regional targeted programs). – Also, Karina Popova negotiated Agreements under the provision of public investment. Administration of Special Communication and Information Support, Department of Internal and Information Policy of the Authorized Representative of the President. – Manage development of federal geoportal of the Ural region within national e-government program. – Develop and integrate web-GIS infrastructure. – Facilitate realization of online administrative processes, improve the accessibility of e-government services for citizens and organizations. – Develop internal and external portals of federal authorities, administrate databases. – Provide electronic integration of sub-systems of e-government among each other and with other federal electronic systems; ensure information security. – Provide statistical analysis of various system data. – Ensure support of emergency services. – In addition, Karina Popova provided mathematical modeling of elections 2011-2013. – in addition, organized and supervised planned work of subordinate employees. Karina Popova engineered and supervised municipal GIS for the Ministry of State Property Management. Especially relevant comprehensive information resource integrating its own electronic maps with data from various city information systems. – Ensured existing technologies support. Full control of all sections in 2 magazines. Youth magazine “Sports-minded” and industrial magazine “Conversion”. – Designed interactive real estate market price distribution map for local authorities. – Developed systems of accumulation, storage, analysis and graphic visualization of spatial data. – Aligned address semantic part of a topographic foundation of the city of Yekaterinburg. – Supervised engineering of specific elements of information content. – Karina Popova developed documentation for program products, online documentation, user interfaces. Karina Popova is a Winner of the international Erasmus Mundus scholarship in the Master’s Course in Geospatial Technologies. The second semester at the WWU provides basic and advanced courses in GIScience. In addition, courses in additional key competencies (project management) are provided. The language of instruction is English. Karina Popova is a Winner of the international Erasmus Mundus scholarship in the Master’s Course in Geospatial Technologies. The first semester offers different learning paths, addressing the previous know-how and requirements of the students. The courses at UJI focus on the provision of know-how in informatics, new media, and GI basics. In addition,UNL provides modules in mathematics, data modeling, and GI basics. The language of instruction is English. Principal subjects / occupational skills covered: Mathematics; Mathematical logic; Information Systems Design. Thesis topic: Development of intellectual information system for decision-making process for the Ministry of State Property Management. Gold medal awarded to Karina Popova for the exceptional academic performance, diligence and exemplary behavior. Certificate of secondary education with Honours. – through the research project of patriotic education of high school students under the auspices of the State Programme “Patriotic education of the citizens of the Russian Federation during 2001-2013”.